Camp Bow Wow Lil' Campers St. Clair Shores Day Camp, a premier dog day care service for dogs under 35 pounds, is Where a Dog Can Be a Dog.® Dogs get to romp and play all day with their fur-iends in our spacious and secure play yards and receive lots of love and attention from our Camp Counselors. Overnight Campers snooze the night away in their own spacious, comfy Cabin with a cot and fleece blanket. They'll wake up happy and well-rested; ready for another full day of play! 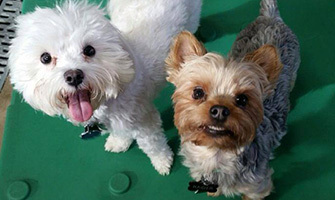 Camp Bow Wow's top-of-the-line facility is designed with the safety and happiness of our Campers in mind. Stop by any time for a tour to see for yourself what a day of Camp is like!